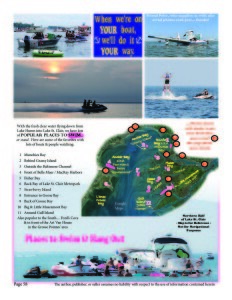 The Lake St. Clair Guide Directory provides Things to Do Lake St. Clair and 100’s of SERVICES around Macomb, Wayne, St. Clair County and Ontario, Canada. We specialize in boating & fishing fun! Check out the seasonal events calendar in the Lake St. Clair Guide 100-page magazine, or review the next months’ events here. We provide the most up-to-date listings of local waterfront community events & area services giving you the most options of Things to do Lake St. Clair. Like us on Facebook to receive the latest Lake St. Clair news & last minute event updates! View listings below …. click city at right to find a service near you …. type in a keyword in the search bar … or “ZOOM in” on our interactive map below for detailed satellite water entrances & basins to help you bring your boat into these Lake St. Clair area services! Check out our NEW Interactive Maps to several categories. Where to eat on the waterfront at Lake St. Clair! Easy to navigate Restaurant Handbook with links to our sponsors social media for FAST information. Boat dockage – 2018 updates – entertainment – happy hours on Lake St. Clair – and much more! The area is great for fishing, and, yes we have many other things to do around Lake St. Clair in Macomb and St. Clair Counties! See the many activities in the area to enjoy your visit. Bayview Yacht Crafters – Harrison Twp. Bayview Yacht Crafters, the Marine Service Specialists. Our year round & manufacturers’ authorized service includes certified mechanics for Mercury, MerCruiser, Yamaha, & Volvo. Blue Lagoon Boating Center in Harrison Township is your one-stop shop! New boats, used and brokerage boats, outboard motor sales, parts and service, Inboard and I/O service and maintenance, general marine parts and accessories, transport, indoor storage. Browns Bar on Harsens Island, since 1946, is a popular boaters’ destination for good food and lots of fun. A seasonal spring/summer/fall restaurant, we are located on the Middle Channel, just a short boat ride off of Lake St. Clair. Our specialties include burgers, wraps, generous salads, and fish & chips. Or come over via the Harsen’s Island car ferry located on M29 near Algonac. Freedom Boat Club – Harrison Township/Detroit, originating in Florida, is the oldest and largest boat club in the nation and makes participating in the boating life simpler and more affordable. Here at Gifts Afloat, find nautical home accessories, Lake St. Clair and Great Lakes souvenirs, men’s and women clothing & Sperry shoes, and seasonal gifts in St. Clair Shores. Harbor Club South Apartments & Marina – Harrison Twp. Harbor Club South Apartments on the water on Lake St. Clair with Resort Style Living with marina for your boat in Macomb County. Boat wells from 20′ to 40′; waverunner ports. Clubhouse with kitchen and restrooms. Electrical & water hook ups and pump outs. Hideaway Harbor Marina in Harrison Township offers Lake St. Clair’s most central location with instant Lake access. View our many amenities including free WIFI, free ice, dock boxes, and more! Hoist service, inside and outside winter storage, along with winterize and shrink wrap – everything you’ll need in one convenient location. Johnny’s Boat Propeller Service has been in Detroit since 1959. Not just propeller sales but also computer inspection and reconditioning! We also offer a full line for new & old outboards & stern drives. Know Your Ships – A great Guide to Great Lakes Freighters passing through the Detroit River, Lake St. Clair and the St. Clair River. Know Your Ships offers everything ship fans need to know about the freighters passing through the area. The Michigan Boating Industries Association is a non-profit trade association dedicated to the promotion, protection and advancement of the recreational boating industry in Michigan. MBIA also sponsors several boat shows in Michigan, including the Metro Boat Show on Lake St. Clair each September at the Lake St. Clair Metropark. Michigan Harbor Marina offers 410 boat wells, 40 covered wells, secured gated outside storage and inside storage. Also on site is a fuel dock, convenience store with bait & tackle, and an on site restaurant. We are located on Lake St. Clair’s L’anse Creuse Bay in St. Clair Shores in Macomb County. Middle Channel Marina – Harsen’s Island (formerly Minnich’s Boats) has new owners and we’ve completely redone the place! We offer a full line of boat & watercraft rentals, along with fuel dock, beer, food, live bait, marine supplies, and convenience store items. River Rat Restaurant – Harrison Twp. Just across from the Clinton River, the River Rat Restaurant is a fun place to stop on your way home from the marina. Wide ranging menu and voted Best New Restaurant by Macomb Daily’s Readers Choice Awards. We offer a separate bar area with 10 plasma TV’s, and a casual dining room with moderate prices and large portions. Summer Discovery Cruises – Harrison Twp. Summer Discovery Cruises! Board the Schoolship “Clinton” to explore the waters and islands of the lower Detroit River or Lake St. Clair this summer. Sponsored by Michigan Sea Grant Extension and the Huron-Clinton Metroparks. Tashmoo Marina offers inside & outside storage on the South Channel near Lake St. Clair. Boat wells, repairs, shrink wrap, winterization on Harsen’s Island. The Waterfront Shoppe on Harsens Island features nautical gifts, home décor and home accessories, resort clothing for women, children and men, name drop T-shirts, sweatshirts, and gifts, and for the children and the young of heart, the “penny candy” is always a fun adventure! Where is Gull Island on Lake St. Clair? The popular boat anchorage area at the mouth of the Shipping Channel is home to the annual first boat event of the year, Jobbie Nooner. Where is Munchies Bay on Lake St. Clair? The popular boat anchorage area to swim is on northern Anchor Bay in Clay Township. Where is Strawberry Island? The popular island where boats anchor to swim is directly east of the Clinton River on Lake St. Clair. GPS coordinates to get you close by are….